If I were not a married woman with two kids, I would be on the road chasing the beasts of the sky. I’m not sure if I would be a tornado chaser or a lightening photographer, but, I would definitely be in the thick of it. This photo is from a storm we’re having tonight on the East Coast. I knew around 2pm that we were going to have something worthy of busting out the lawn chair and popcorn. A few hours later we have pockets of severe lightning and rain…and now this lovely lightning maker has rotation leaving us with tornado warnings and a few sighted tornadoes. I love it! There is nothing like a jolt of thunder to get your blood pumping. It never gets old, you know. No matter how many thunderstorms you may witness in a lifetime, you are broken down to a jaw slacking sense of awe every time the sky unleashes her fury in flash flood conditions and the surprise blinding flash of lightening so close you don’t really know where it came from or where it hit. 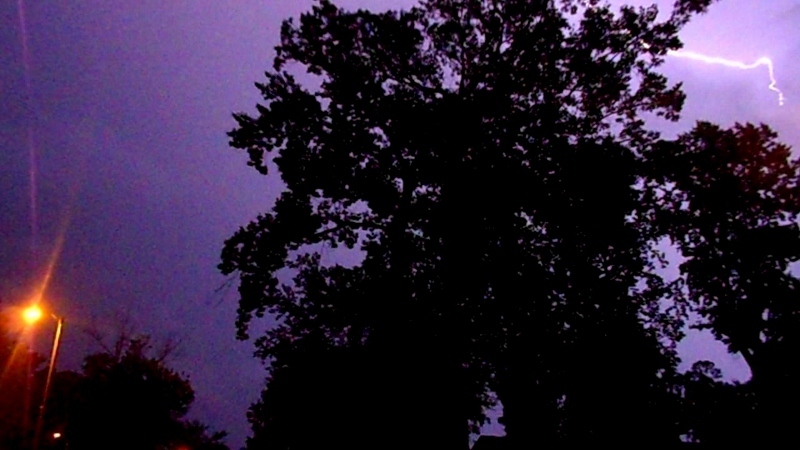 It’s a fabulous thing how the thunder never disappoints. Around here it echos through the valley in a way that makes it seem even louder. 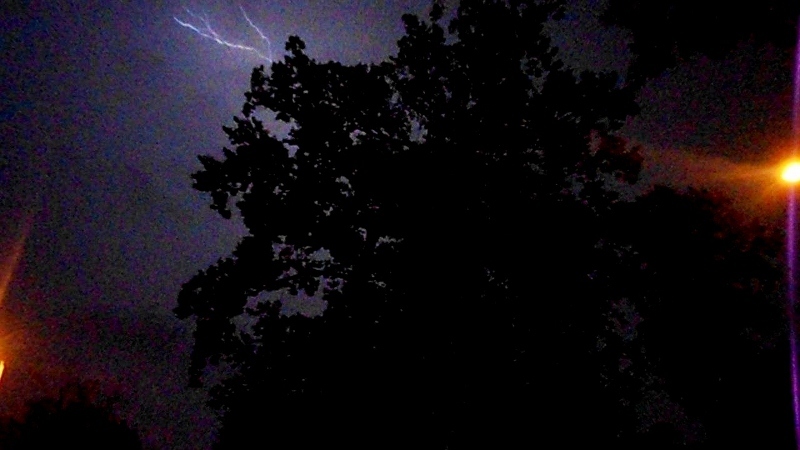 Call me crazy, but there is nothing better than a summer thunderstorm. As one of the assignments, it’s unfortunate that I had to attempt to draw myself. It official, I will never have a job working as a sketch artist for the police. I find it incredibly difficult to draw people. I’ve always been in awe of people who could not only draw a likeness of someone, but to be able to capture the personality as well. So far, the only thing that I really captured in my sketch was my snotty little smirk, everything else is questionable. Sketch #5 I have been instructed to do a quick drawing of an interior scene with the lines going to the end of the paper. I did get a smudge on the bottom, so I cropped that out, but this is the gist of a corner of my living room. Looks very cartoony, lol. Sketch #4 I have been instructed to draw a small object. I don’t think I’m supposed to use shading yet, but I was bored, so I figured, why not. This is Sketch #3 and I must say that I definitely bit off more than I could chew with my subject choice. With no use of tools like a ruler or protractor, I had no business trying to knock out a fence. 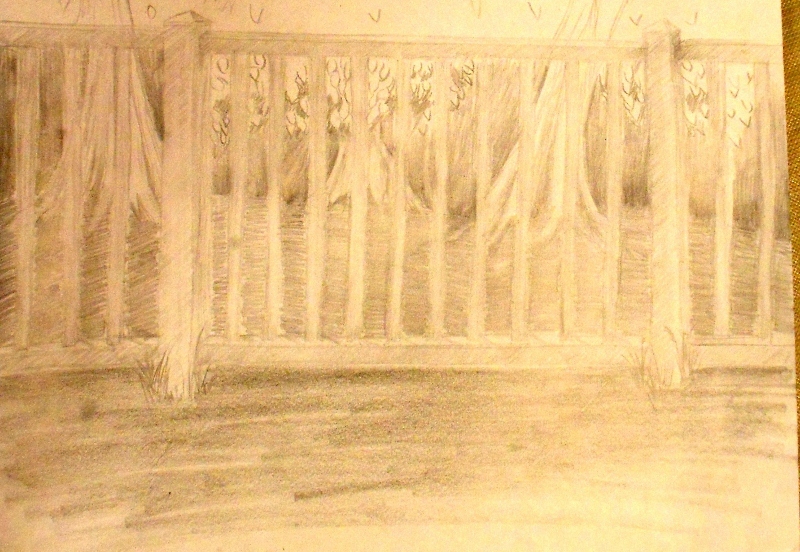 By the time I had finished the fence, the sun had already moved and the lighting had changed. Then there is all of the leaf detail. I simply had to drop the pensil and walk away from this one or I would have spent hours on end. Next time I will focus something smaller so I can work more on shading and less so on details. Sketch #2 I have come to realize that books are much harder than I ever dreamed. It’s all in the angles and I’m sorry to say that I still haven’t got it right.